It was SOAP day!!!!! Today's recipe was olive oil, shea butter, coconut oil. OMG its so rich. Raspberry fragrance oil. The whole place smells like raspberries. 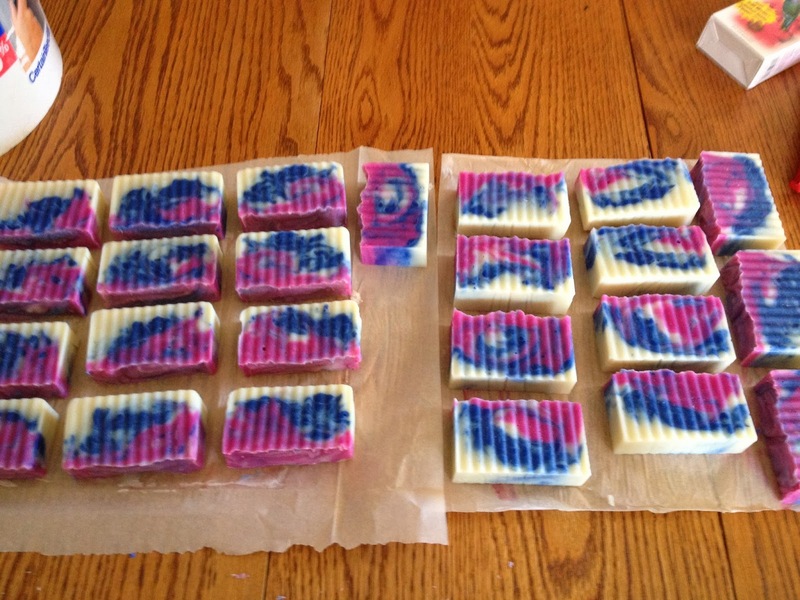 I use the room temperature method to make my soap and will share the creative process here. Something that inspires such an internal giddyness but has to be shared. I absolutely love making soap . I like knowing what is going on my body. I don't want to pick up a label on anything and see a bunch of chemical compounds listed. I prefer to keep things simple. I don't want weirdness in my food nor my skin products. For me, creating from heart trumps dollar any day of the week and think the stuff we surround ourselves with DOES make a difference in how the world unfolds before us. We are a perfumed chemically saturated society. I just want my skin clean and moisturized without drowning in "plastic". Might be a small step but it all thins the veil, the illusion humans have created. Things don't have to be so darn complicated. Ok..I'll get off my soapbox but not before sharing a picture of one of my favorite blends. This one has canola oil, cocoa butter and coconut oil.